In the early 1980s, Harry E. Figgie, Jr. (the founder of Figgie International, Inc.) became concerned that the United States' Government was following the same destructive path that lead countries such as Argentina, Bolivia, and Brazil into hyperinflationary economic collapse. In the 1980s, each of these South American countries were running massive annual deficits, were accumulating unmanageable national debts, and each respectively had a central bank creating money (out of thin air) at a reckless pace. In looking at the frighteningly similar profligate behavior, on the part of the U.S. Government, Mr. Figgie became concerned that hyperinflation could emerge in the United States as well. As a result, we initiated research of our own, and chose our target South America - specifically Bolivia, Brazil and Argentina - as the best available examples of economies suffering high inflation rates. We put together a three-person team headed by Dr. Gerald Swanson, a University of Arizona economist and director of the Academy for Economic Education. The team went to South America four times over a two-year period to study the development of inflation and its impact on businesses, individuals and governments. They interviewed 80 leading bankers and industrialists and a considerable number of ordinary citizens throughout Argentina, Brazil and Bolivia. As a result of this research, Dr. Swanson wrote The Hyperinflation Survival Guide: Strategies for American Businesses (which was first printed in 1989). The superb content of this book can be attributed to Mr. Figgie's foresight and to the outstanding research and writing of Dr. Swanson. What follows are a brief "Austrian" perspective about this book and then specific details about the book's content. Monetary calculation is the guiding star of action under the social system of division of labor. It is the compass of the man embarking upon production. He calculates in order to distinguish the remunerative lines of production from the unprofitable ones, those of which the sovereign consumers are likely to approve from those which they are likely to disapprove. Every single step of entrepreneurial activities is subject to scrutiny by monetary calculation. The premeditation of planned action becomes commercial precalculation of expected costs and expected proceeds. The retrospective establishment of the outcome of past action becomes accounting of profit and loss. A tool businessmen use to determine the success or failure of past actions is a financial statement (which includes a balance sheet and an income statement). It is important to understand that all entries in the balance sheet and income statement are expressed in terms of money. Under conditions in which money's purchasing power is stable, a businessman can directly correlate whether his company's capital base (i.e. the company's net worth as reflected in the balance sheet) is expanding or contracting depending upon if the company turned a profit or made a loss. Such monetary calculation assists a businessman in deciding to maintain or change a business plan based upon satisfying the ever sovereign consumer. ...the inflationary process inherently yields a purchasing-power profit to the businessman, since he purchases factors and sells them at a later time when all prices are higher. The businessman may thus keep abreast of the price increases (we are exempting from variations in price increases the terms-of-trade component), neither losing or gaining from the inflation. But business accounting is traditionally geared to a world where the value of the monetary unit is stable. Capital goods purchased are entered in the asset column "at cost," i.e., at the price paid for them. When the firm later sells the product, the extra inflationary gain is not really a gain at all; for it must be absorbed in purchasing the replaced capital good at a higher price. Inflation leads him to believe that he has gained extra profits when he is just able to replace capital. Hence, he will undoubtedly be tempted to consume out of these profits and thereby unwittingly consume capital as well. Thus, inflation tends at once to repress saving-investment and to cause consumption of capital. Indeed, inflation can lead to entrepreneurial error and, thus, to business failure. 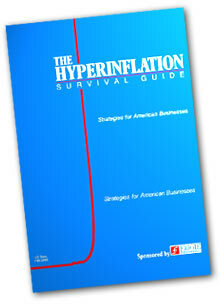 The Hyperinflation Survival Guide provides excellent strategies for businessmen to adopt and act upon should hyperinflation emerge. Although this book is geared more toward owners/managers of manufacturing companies, operating under inflationary conditions, any businessman (and any individual) can garner excellent advice from this insightful book. The four chapters in this book cover financial management, marketing strategies, manufacturing decisions, and industrial relations. Make absolutely certain your managers understand the time value of money. Never allow your cash to remain idle. Good cash management can provide a major source of profit, while poor cash management can destroy a company in a matter of months. Be prepared to convert dollars into a stable foreign currency. Be aware that the stock market may become an uncertain source of capital. Be prepared to maintain more than one set of books. Inventory valuation should be based on NIFO (next in first out) rather than LIFO. Develop an appropriate inflationary adjustment for capital replacement or the value of your capital will disappear. Chapter two is titled "Marketing Strategies". Pertaining to the "4Ps" of marketing (price, promotion, place, and product), this book concentrates on pricing and product. A fact of life in a hyperinflationary economy is the disappearance of products whose controlled price does not cover the cost of production. In Brazil, for example, dairy products such as milk, eggs and cheese became unavailable when the regulated price was set below their production cost. Likewise, in the United States, high volume products with extensive competition--characteristic of many consumer products--may be the first to disappear should inflation begin to rise, because they tend to have low profit margins. With respect to pricing, the book conveys that pricing "...policies undergo a dramatic transformation during hyperinflation. Fluid pricing becomes an absolute necessity, and prices must change frequently and sharply to accurately reflect the impact of inflation. True costs become increasingly difficult to track, even as the need to do so grows more important." For Americans, it is hard to imagine products disappearing from the marketplace let alone having to cope with hyperinflation. Just imagine the nightmare Bolivian businessmen went through, in 1985, when inflation hit 50,000% annualized. Upward price adjustments would have to be made by the hour. These upward adjustments accumulate to the point of seeming absurd. For example, under 50,000% inflation, a $25 necktie would cost $12,525 one year later. In chapter 3 (titled "Manufacturing Decisions"), Dr. Swanson emphasizes that management must be flexible and innovative. In fact, corporate survival may require radical decisions. For example, during "...periods of high inflation, manufacturing operations are particularly hard hit. In fact, in some extreme cases in South America, corporate attempts to survive have led some companies to shut down their manufacturing operations in favor of speculation, which can be a more profitable use of capital." The cold reality here is that the rates of return on speculating in commodities and currencies (under conditions of severe inflation) may exceed the rates of return on capital projects. In turn, this means laborers will lose their jobs. Anticipate that your purchasing department will assume a more important role in the long-run survival of your firm. Be aware that hyperinflation creates increased opportunities for corruption. Effective cost control requires that you develop methods for estimating your internal rate of inflation. Anticipate difficulty in maintaining capital expenditure programs. Chapter 4 of this book is titled "Industrial Relations". It could just as easily be titled "Employee Relations". As Dr. Swanson and his team discovered in South America, the impact of hyperinflation on wages and benefits was stunning. For instance, "...Brazilian employees who were not given raises in the first three months of 1988 watched their buying power plummet 64 percent. Even worse was the spring of 1985, when Bolivians saw their real income drop 90 percent in only three months." Such bouts of inflation become especially difficult for businessmen to cope with as inflation is inflicted upon society by a government's reckless monetary creation (out of thin air) while, in turn, government regulations (for the alleged purpose of controlling inflation) prevent employers from granting raises to employees. Unfortunately, employers take the brunt of the blame for the declining living standards (that employees experience during bouts of severe inflation) when government is the real culprit. This is certainly true in Bolivia, Brazil and Argentina, where the union movement is very strong in both the public and private sectors. Some South American business leaders go so far as to complain that union leaders actually use hyperinflation to their own advantage, recognizing it as a major source of their power. Because wages continually lag behind rising prices during hyperinflation, there is a near-constant need for negotiations, as union members press their leaders to push for higher wages. Labor relations staffs should be prepared to face stronger unions and virtually continuous negotiations. There is a high likelihood that wages will at some point be frozen, and labor will apply pressure on management to circumvent controls. Prepare to shorten pay periods. Anticipate morale problems among middle management, which often bears the greatest burden during hyperinflation. Consider the type of index you will use for cost-of-living adjustments, and be prepared to make adjustments often. Fringe benefits must be adjusted to reflect inflation or they can disappear. This book's appendix provides a nice bonus as it covers the disastrous results of the wage and price controls President Nixon implemented to "combat" the United States' 4.7% inflation rate and its 5.8% unemployment rate. Two of the most notable actions President Nixon undertook on August 15, 1971 included an immediate 90-day freeze on wages, prices, salaries and rents and of course, the reprehensible floating of the dollar (by severing the last vestige of the dollar's linkage to gold). For a president to state that severing the dollar's link to gold will help reduce inflation completely defies logic. In reality, what President Nixon "accomplished" was to enable the federal government to create money without limit. How such an irresponsible action can be construed to be anti-inflationary is a sad testimony to the economic illiteracy of the American populace. Domestic reaction to Nixon's proposal was overwhelmingly positive. Leaders of the nation's corporate giants, believing that some sort of action was overdue, responded with general enthusiasm, and opinion polls showed broad support among the populace. In all, President Nixon implemented four phases of wage and price controls (with the final phase ending in April of 1974) and the results were predictably terrible. For example, there were shortages in beef and textiles. Moreover, prices rose at an average annual rate of 6 percent while the controls were in place, yet in the eight months following the end of Phase IV, prices climbed at an annualized rate of over 12 percent. Of the books published regarding hyperinflation, this may be the only one that provides effective strategies for operating a business under conditions of a rapidly depreciating currency. To reiterate, "The Hyperinflation Survival Guide: Strategies for American Businesses" was written by Dr. Gerald Swanson (an associate professor of economics at the University of Arizona). Harry E. Figgie, Jr. sponsored the research and the original production of this book. As it was originally printed in 1989, it was way ahead of its time. However, this doesn't change the fact that this book will prove to be an excellent resource for businessmen and individuals once the Federal Reserve's destruction of the U.S. dollar enters its terminal stage.